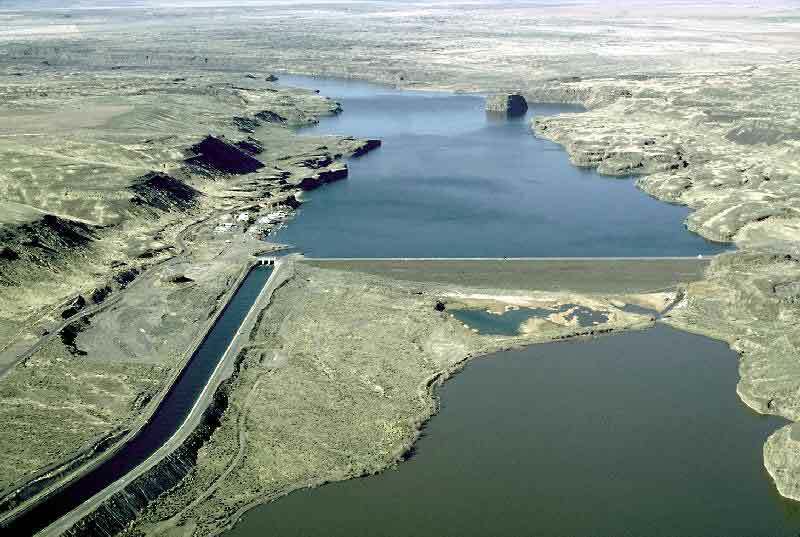 The Columbia Basin Project is an immense irrigation development in central Washington state that provides water from the Columbia River to about 671,000 acres (268,400 hectares) on the Columbia Plateau. The project is in the Big Bend area of the river, which includes the cities of Ephrata, Quincy, Moses Lake, and Othello. Water from Lake Roosevelt behind Grand Coulee Dam is pumped uphill to a 27-mile-long reservoir, Banks Lake, from which it flows by gravity into a series of canals. Outlets for unused water empty into the Columbia above Richland and Pasco more than 125 miles to the south. The project includes more than 300 miles of main canals, 2,000 miles of laterals and 3,500 miles of drains and wasteways. The project provides irrigation water to 2,050 farms. Apples, wheat and corn are the largest-volume crops. There also are large herds of dairy cows and beef cattle. Annually, the cash value of farm production in the Columbia Basin Project is about $630 million. O’Sullivan Dam on Crab Creek about 15 miles south of Moses Lake creates Potholes Reservoir, which captures return flows from the northern half of the project. The Potholes Canal flows out of the lake and serves the southern part of the project. Pioneer farmers of the late 19th century recognized the agricultural potential of the rich soil of the plateau, but with annual rainfall averaging less than 20 inches, and with most of that falling as snow in the winter, dryland farming was difficult, at best. The plateau is dotted with the leaning or collapsed remnants of barns and other buildings abandoned by farmers who gave up for lack of moisture. The federal Reclamation Service, created in 1902, first investigated the project area in 1904, but determined water could not be lifted from the Columbia River canyon, in places more than 500 feet deep, up to the plateau. In 1922, a survey conducted for the Army by George Goethals described the irrigation potential of the plateau and recommended that water be delivered to the area via a 200-mile canal that would tap the Pend Oreille River in northeastern Washington. At the same time, the government also was investigating the hydropower potential of the Columbia, which as yet had no dams. A dam that would provide water to the plateau by diverting the Columbia into the Grand Coulee had been discussed publicly since 1892. Such a dam was one of at least 10 the Army envisioned in its report, and irrigation promoters seized on its potential to impound a lake and provide irrigation water. A fierce public relations battle ensued between those who favored a canal — the “ditchers,” they were called — and those who favored a dam tall enough at the Grand Coulee site to make pumping feasible — the “pumpers.” Each side had powerful allies. The Washington Water Power Company of Spokane, fearing competition from a federal dam, favored the canal, as did the state of Washington; public power supporters including Rufus Woods, publisher of the Wenatchee World newspaper, favored the dam. In the end, with the backing of the Corps of Engineers and important local and national politicians, including President Franklin Roosevelt, the dam was built — it was completed in 1941 — and, ultimately, its companion irrigation project, which Congress initially authorized in the Rivers and Harbors Act of August 1935 and then reauthorized in the Columbia Basin Project Act of March 1943. Historian George Fuller, whose book, A History of the Pacific Northwest with Special Emphasis on the Inland Empire was published in 1931, when Grand Coulee Dam was still a dream on blueprints, considered the “uncultivated area of the Columbia basin which awaits irrigation” to be the greatest potential source of wealth in the region. He estimated that 2 million acres could be irrigated and that the Columbia Basin Project would be larger than all other federal irrigation projects put together. The project, he wrote, “is likely to bring another million people to the Pacific Northwest.” It didn’t, but the project did eventually grow to irrigate a vast area, and thousands of people moved into the area to start farms. On May 29, 1952, the first irrigation water began flowing into the project canals. Key agricultural products include grain, alfalfa, silage crops, dry beans, fruit, sugar beets, corn, potatoes, seed and some specialty crops. The project diverts 2.3 to 2.7 million acre-feet of water annually from Lake Roosevelt, which is just over 2 percent of the average annual flow at Grand Coulee. The pumping station is a power plant in its own right, as six of the 12 pumps are reversible. Water can be sent back down the pipes and through the pumps to generate electricity. The generating capacity of the pumping station is 314 megawatts, or enough electricity for about 188,000 Northwest homes.